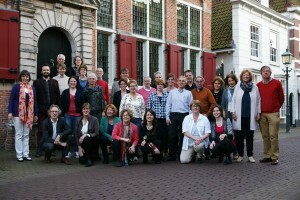 The Voorburgs Vocaal Ensemble is a chamber choir consisting of 29 enthusiastic and dedicated members. The choir was founded in 1978 and since 1987 Marijke van Klaveren has been the choir’s inspirational leader and conductor. Over the years, the VVE has compiled a broad and varied repertoire, consisting of sacred and secular music from practically all style periods. Polyphonic a capella pieces are most commonly performed, but the VVE also cooperates with soloists, both vocal and instrumental, as well as musical ensembles. Within this broad spectrum, the VVE has developed a preference for musical works from the late romantic period as well as impressionistic music from the 20th century. In recent years, the choir has performed music written by Byrd, Brahms and Mendelssohn as well as lesser-known composers such as Rheinberger and Nystedt. To this list we can add the Nicolas Cantate by Britten, performed in cooperation with the children’s choir Musicanti, the spectacular Chichester Psalms by Leonard Bernstein, Mozart’s Requiem and several passion pieces such as Via Crucis, by Frans Liszt, Matthäus Passion by Heinrich Schütz, De Veertien Stonden (14 Stations of the Cross), by Hendrik Andriessen, and the Choral Passion op. 7 (1932) by Hugo Distler. The VVE performs approximately six times a year. We have had the privilege of singing in some of the area’s most beautiful churches as part of a concert series or choir festival. Every two years the choir organizes a weekend that combines intensive study with fun, social activities.